Click on the images above to view them full size. Ladywell Gardens lies at the lower end of the town, as you look towards Crosshill. It is situated in Ladywell Road and for many years was a neglected area with nobody accepting responsibility for maintenance. Some five years ago May-Tag Ltd, managed to get some funding to do basic work and maintenance in response to a plea from local residents that the area was unsightly and could be the source of an accident to local children as it is a very steep-sided. However in 1999, funding was obtained to create a more extensive environmental feature of which the town can be proud. The funding came from several sources, from the Scottish Executive Rural Challenge fund, from South Ayrshire Council which supplied materials and from Scottish Enterprise Ayrshire, which supplied funding for landscape design and tools and equipment. May-Tag Ltd supplied the student labour and the training and supervisory staff. The site originally housed weaver's cottages, some features of which can still be seen in the original walls. 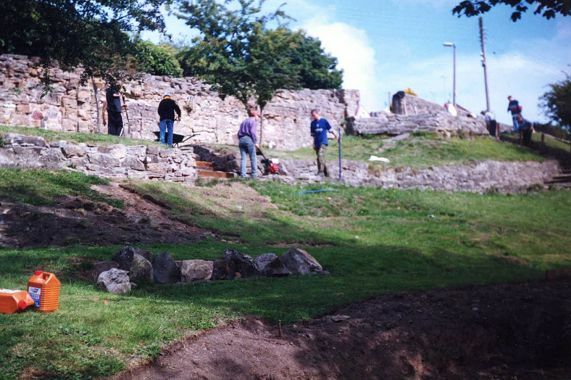 These walls were, therefore, maintained and repaired where needed. The pictures show some of the variety of work undertaken. 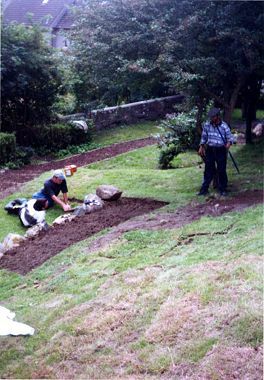 Paths were relaid and re-aligned and a rockery was constructed, using boulders from the site. Bushes and trees were planted to enhance the rockery. 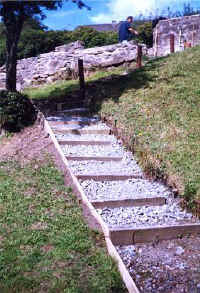 Existing steps were repaired and new paths and steps, fitting in with the environment were constructed. Gates and fencing were repaired and in some cases totally renewed. One of the major tasks was to make safe the main entrance where there was no gate and a steep drop of some five or six feet to the next level. 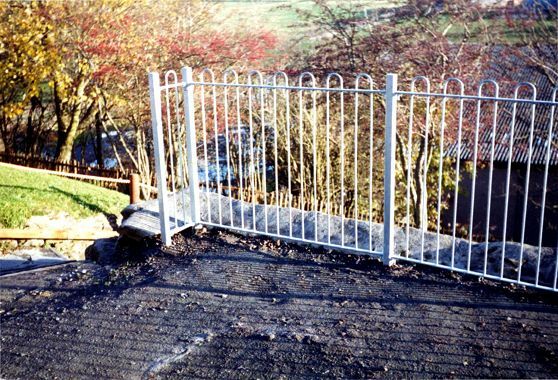 A gate and matching solid fencing were fitted to ensure that children could use the entrance safely. The entrance veers to the left where there is a rustic crazy paving pathway and steps leading to a walkway right round the Gardens. To the right a whole new set of steps and protective railing were constructed, to allow a choice of pathway at a higher level, leading to the main pathway. Rustic seats were crafted from wood by students and fitted and waste bins were provided. A smaller gate has been fitted to the southern entrance. Trees, bushes and plants, all of low maintenance, will make the Garden an attractive and colourful place for local residents to walk or sit in the summer evenings. A timber gate has been constructed and will be fitted at the northern entrance to the Garden. The work has been very challenging, and has provided extensive and interesting work for students who have picked up a variety of soft and hard landscaping skills as well as teamwork and communication skills. For staff, the Garden provided other challenges - health and safety had to be a priority in a steeply sloping area and supervision in such a wide area could at times be demanding. However, it is hoped that when the last plant is in place, which should be in a few weeks time, that staff and students can have some kind of celebration.